Every organization uses some form of measurement to track progress towards the goals and performance of the business. These typically include measures of production, profit, quality, customer satisfaction, to name a few. When these metrics are leading measures, they allow you to take corrective action when performance drops. A major component of most safety programs is the prevention of musculoskeletal disorders (MSDs) through ergonomics design. Unfortunately, most organizations use the traditional safety measures of recordable injury/illness rate and costs (lagging measures) to drive the reduction of MSDs. 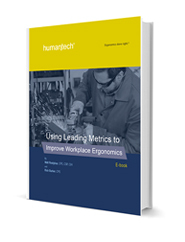 This free e-book provides you with best practices and proven measures which, when used and tracked, will help your organization find and reduce the conditions that cause MSDs and improve the working conditions for your employees before they get hurt. Leading measures are your crystal ball, providing advanced warning of exposure to hazards and the potential for an injury to result.